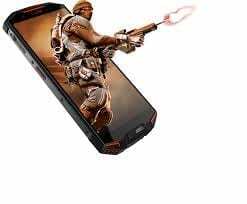 Gaming smartphones is a growing niche with the like of Xiaomi Black Shark, Asus ROG Phone, Razer Phone amongst others. Joining the league, is the Chinese smartphone maker Doogee, with the Doogee S70. A gaming/rugged smartphone, the Doogee S70 is far down from the others in the area of specs which is much needed for gaming. There is the MediaTek low tier chipset and the GPU is not really the best for a good gaming experience. 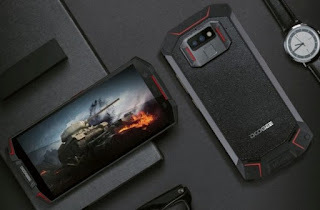 You could guess the rugged side by the looks as it maintains the build from the Doogee S60. It does maintain the octagonal shape with trimmed off edges and a polycarbonate and metal mix design. According to Doogee, it boasts of a hollow build to.improve heat dessipation with temperature is most likely to rise. during gaming. Besides that, the smartphone is also water resistant up to 1.5m deep for 30mins and doesn’t get affected by dust too. The overall look here does not deviate much from what you hav on its predecessor. On the display end there is an okay well sized screen and a good resolution too for a gaming phone. Being LCD, you might not get as much contrast or deep blacks as in OLED screen. Nonetheless, the display type weighs less on the battery in comparison to others and with 5.99-inch you can enjoy more on-screen time. Gaming should appear vivid enough with the 2160 X 1080 pixels resolution (Full HD+) on board. It packs quite a lot of battery juice which is good considering gaming consumes a lot of power. Stocked up with a large, 5, 500mAh you need not worry too much about your battery going down. Also, you will be getting 15W fast charge thrown in with the big battery to make sure that your battery gets back up in no time. Interesting enough, the smartphone packs a nice set of cameras even goes ahead to feature a dual camera at the back. For taking selfies you are going to be using the 16MP camera at the front while the duo at the back are12MP and 5MP sensors. To be honest, the arrangement here is quite disappointing for a gaming smartphone. Others in this category come with flagship chipset or something close, however, what you have here is nothing close to flagship. Also, the GPU on the smartphone needed to make the game graphics looks good and run smoothly is below par. Joining the MediaTek Helio P23 and Mali-G71 GPU is 6GB RAM and 64GB storage space that your can expand to 128GB. You can also find the modified Android 8.1 Oreo on the smartphone even if though there is Android 9 already. The smartphone is sole for about 85, 000 Naira depending on the deal and your location.